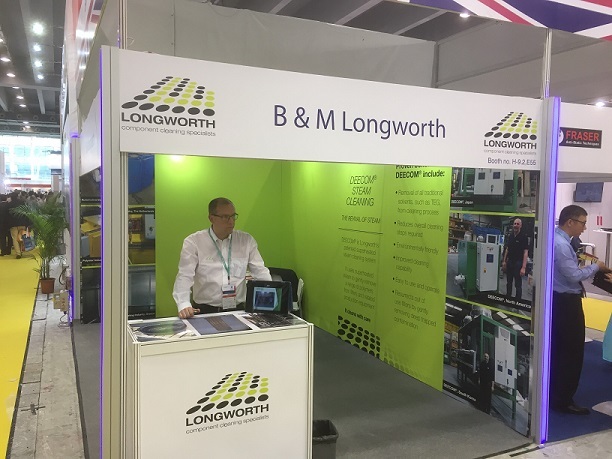 May 2017 saw the Longworth team visit Guangzhou in China to introduce DEECOM® at the CHINAPLAS exhibition, which was very well received by visitors. We experienced a positive exhibition as part of the British Plastics Federation (BPF) British pavilion and were pleasantly surprised to find many visitors from other countries i.e. India, Pakistan, Malaysia, Sudan, Europe, Korea, Japan, Thailand and others around the globe. CHINAPLAS has been certified as a “UFI Approved Event” by the Global Association of the Exhibition Industry (UFI), an internationally-recognized representative body of the international trade fair sector. This endorsement further demonstrates CHINAPLAS’ proven track record as an international event, with professional standards of exhibition and visiting services as well as quality project management. We feel that the current need in China to improve environmental impact will allow us to set up joint ventures. Our joint venture opportunities include agent agreements, investments and partnership in the region. We left with lots of interest, new contacts and actions for the short, medium and long term for delivering improved cleaning with lower cost, less damage to environment and longer life cycles for components across a multitude of industries. The team is now looking forward to Plastimagen 2017 in Mexico this November as we take DEECOM® global. DEECOM® uses superheated steam to gently remove a range of polymers from filters and related production equipment. To read more about how DEECOM® could help increase the productivity of your filters and components, visit our DEECOM® page. For more information or to enquire about our products and services, give us a call, email or fill out the enquiry form and we’ll get in touch with you ASAP.